I am not the enemy, ladies. Should I feel guilty about having fun at the pro-choice rally in D.C.? I believe in the cause wholeheartedly. It’s a matter of life and death. But Suzanne asked me to go with her and her friends and I wanted to seduce her. It was mayhem, as expected. The crowd was estimated at a half million people. How can they know for sure? Regardless, I think we got our point across. I thought it was going to be a gentle, rolling sea of delightful bachelorettes but it was actually a raging tsunami of pissed-off political militants. There were portions of the rally that were downright anti-man. I felt like the enemy. I am not the enemy! I’ll tell you what it was a sea of: lily white faces. 100% Caucasian. Where was the minority representation? It’s their cause, too. Planned Parenthood sponsored a special non-stop train there and back. I stopped at the Middle Eastern bakery on Atlantic Avenue in Brooklyn the night before to load up on snacks for the trip. I bought dried apples, cashews, dried bananas, peanuts, dried apricots, yoghurt covered raisins, some breads and a big bottle of water, the total of which weighed about 70 pounds. I got the gold medal for snacks. A fun, healthy, politically progressive combo. By the end of the day my body ached for a thick, undercooked cheeseburger. They all brought boring stuff to eat and glommed off my stash. We got to the Washington Monument late in the morning. Bella Abzug spoke as well as the editor of Ms. Magazine and a bunch of other women. No men. None of them said anything new or inspirational. I was disappointed. You’d think a crowd that size would light their words on fire but each speaker was as boring and predictable at the next. Peter Paul & Mary sang “If I Had a Hammer.” Seriously? It’s not 1968, you idiots. Do something relevant. I wish Bush could ovulate. We finally moved and marched past the White House, which I’d never seen in person. It’s tiny. It’s like a toy model of the real thing. El Presidente made damn sure he was in Camp David for the weekend. The march ended at the other end of The Mall by the Capitol Building. More bad speeches. Cindi Lauper sang a pretty song. There were a bunch of neo-hippies banging bongos, congas and drums with broken skins. At one point, Suzanne and I were sitting on a curb resting. I was spinning my web when, suddenly, bunch of them formed a drum circle around us and started drumming and chanting. There was some freeform interpretive dance that made me laugh very hard (inside). They resembled dying poultry. There were so many different agendas being addressed that I began to feel disengaged from the core reason for the march. There was a feminist speaking (screaming, actually), calling for a new political party composed of just women, gays and minorities and with that voting bloc, they would take the White House this fall. Let me know how that works out, dreamers. Oh, and by the way, thanks a lot. Part of her speech was an attack on Middle America. You know, where my family is from. She screamed, “They don’t want US, so WE DON’T WANT THEM!” That’s a marvelous approach to our problems. Build those bridges, cupcake. We got back to Penn Station about 11:30 at night. Everyone was exhausted, dirty and quiet. On the way up the escalator I thought the girl in front of me looked an awful lot like Mary Stewart Masterson. In the Times this morning, it said she attended, so I suppose that was her. Pretty. I spoke to many, many people throughout the day and at some point in a conversation, I was eventually asked, “So, where did you go to school?” I like the look of disbelief on people’s faces when I tell them I’ve never stepped foot on a college campus. It allows me a brief respite from my self-loathing, which usually returns in fairly short order. 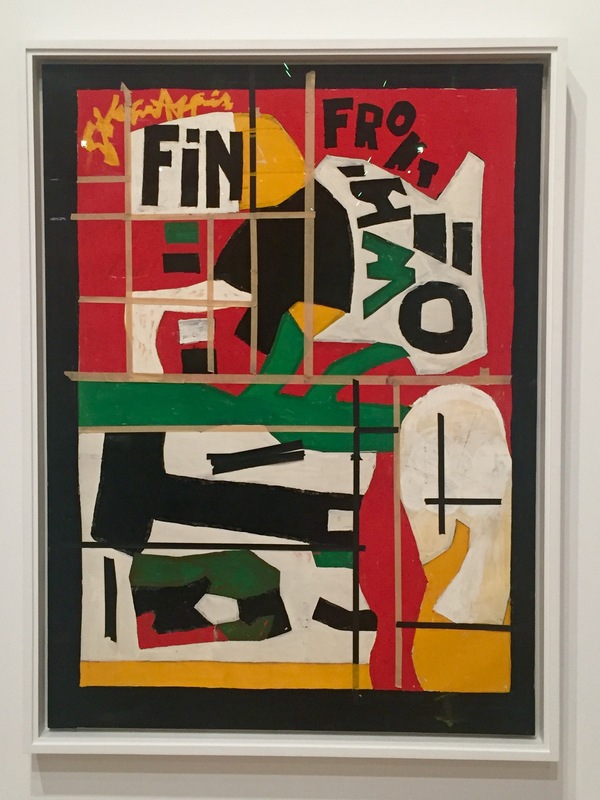 There’s a great Stuart Davis exhibit at the Whitney. He’s one of my favs. He plays to my graphic design sensibilities. On June 23, 1964, after watching a French film that ended with ‘fin,’ Davis added it to the painting on his easel before going to bed. That night, he had a stroke and died in the ambulance on the way to New York’s Roosevelt Hospital. That’s how I’d like to go. Do the thing I love the most, go to bed and never wake up. 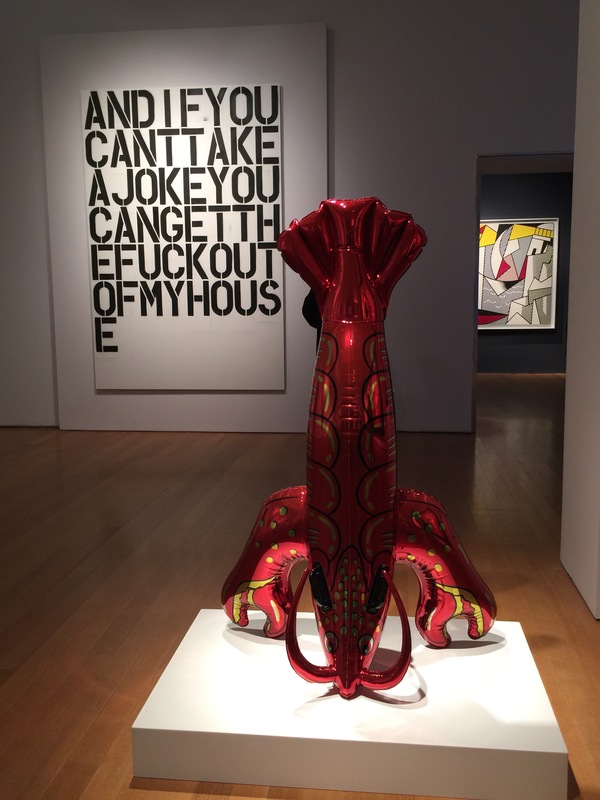 That Christopher Wool is such a fraud. But Jeff Koons! What an innovator! Only $6 million? Kidding. What does either piece mean? Anything? The lobster was interesting in that it looked exactly like an inflatable pool toy. You didn’t know it was metal unless you rapped it a few times with your knuckle.